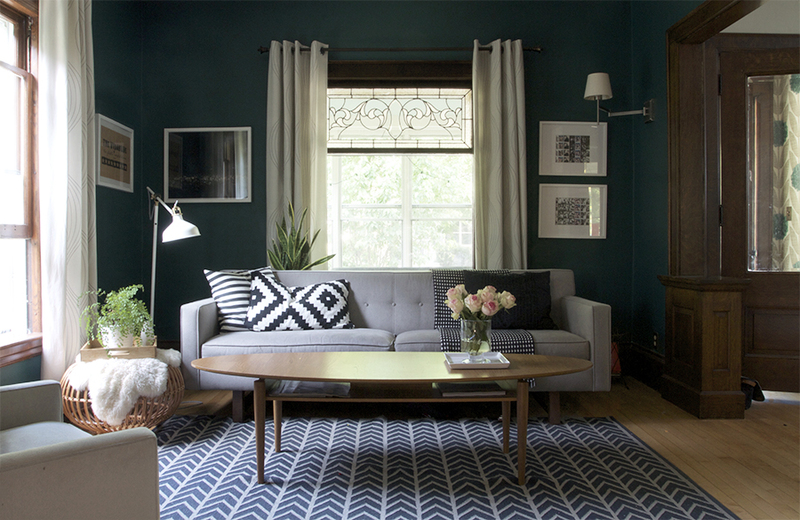 Design Perspectives Blog | Tips and information on design, decorating, remodeling and staging. Convert a tub/shower combo to a more user-friendly walk-in shower. Create a more easily cleaned countertop by eliminating the lip around the bathroom sink. Expand counterspace by extending the countertop under a recessed linen upper. Create more storage space with a taller vanity with eight drawers with two bonus drawers in the linen upper. Visually enlarge the space through the use of a frameless sliding shower door, shower tile installed to the ceiling, a recessed linen cabinet with a glass front and shelving and a taller custom-framed mirror. The room was made more visually appealing with the stunning combination of Sea Pearl quartzite paired with elongated 2×8.5 polished subway tiles installed in a herringbone pattern. The new cabinet with inset doors and drawers is painted in Sherwin Williams’ bold Tin Lizzie providing a contrast that pops the quartzite countertop and polished chrome bathroom hardware and fixtures. As part of her kitchen update, my client lowered her breakfast bar to counter height. The benefits include a better connection between the kitchen and casual dining area, but also more counter space for food prep, serving or dining at the bar. With such stunning new Taj Mahal countertops and more elbow room, more sophisticated and more comfortable barstools were in order. Hancock and Moore with their huge assortment of leather colors and textures was our clear choice. The Ellie barstools selected embody the perfect blend of form and comfort. 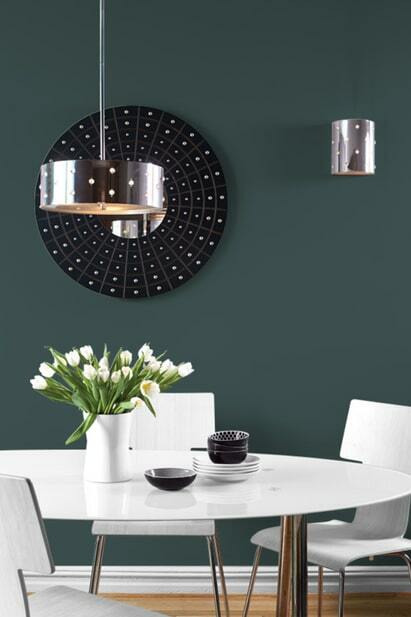 PPG Paints has named Night Watch, a luxurious deep green, as its 2019 Color of the Year. The shade, which evokes lush foliage and the soothing influence of the outdoors, will be at the forefront of next year’s design trends, according to PPG’s global color experts, who chose the color during an international color summit held in February. This client has a myriad of home improvements in mind – a new kitchen, floors, furnishings and window treatments are all on her wish list. But with water dripping through the wall from the Jack and Jill shower through the ceiling below, this space jumped to the top of her list. What a great excuse to select new Super White granite countertops in combination with glossy white beveled subway tile for her shower and polished Carrara marble hexagon mosaic for her bathroom floor. Polished chrome plumbing fixtures, hardware and bath accessories add sleekness and shine. Paint replacing a combo of floral and striped wallpaper and taller framed mirrors enlarge the relatively narrow space. Completed just in time for her holiday company to enjoy. Interesting to me just how much PEACOCK BLUE looks like Sherwin Williams’ OCEANSIDE, which was their Color of the Year for 2018. Who’s inspiring whom? A visually appealing workspace impacts not only employee moral and productivity, but also communicates an elevated degree of professionalism to clients. Over the weekend, with a modest budget, Design Perspectives added art, accessories and greenery to an otherwise ordinary workspace. Monday morning the office was abuzz with excitement. A side benefit, employees were motivated to organize and de-clutter to more thoroughly enjoy and take pride in their revitalized office.